FEMA's administrator, Brock Long, is quitting. He announced his resignation amid months of controversy over his use of government vehicles. 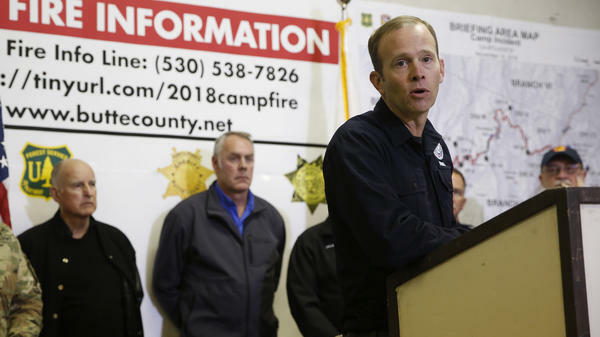 Long was faced with myriad disasters in his two years at FEMA, including five major hurricanes and several deadly wildfires. Here's more from NPR's Brian Naylor. BRIAN NAYLOR, BYLINE: William Brock Long was confirmed by the Senate in June of 2017 and was quickly faced with three hurricanes - Harvey, which caused widespread flooding in the Houston area; then Irma and Maria, which led to nearly 3,000 deaths in Puerto Rico. FEMA's response to Maria was criticized by local officials on the island as inadequate. And in an after action report, FEMA itself said the agency was understaffed and lost track of some supplies. Last summer as Hurricane Florence moved toward North Carolina, Long said responding to major storms involved a coordinated effort. BROCK LONG: Successful disaster response and recovery is one that's locally executed, state managed and federally supported. So what FEMA is doing is prepositioning the federal government's assets to support each one of those governors that are about to be impacted with achieving their response and recovery goals. And that's the way emergency management and disaster response works best. NAYLOR: As Long was dealing with the effects of a hurricane in his home state last summer, a report by the Department of Homeland Security's inspector general found he had misused government vehicles and agency staff to travel between Washington and North Carolina. There were reports he was ready to quit then. He agreed to reimburse the government $151,000 for his travel costs. In a statement yesterday, he said he could not be prouder to have worked alongside the devoted, hard-working men and women of FEMA for two years. Homeland Security Secretary Kirstjen Nielsen says Deputy Administrator Pete Gaynor will serve as acting administrator when Long leaves. Gaynor is a career emergency manager who led the Rhode Island Emergency Management Agency before coming to FEMA. Brian Naylor, NPR News, Washington. Transcript provided by NPR, Copyright NPR.